Round two of the 2016 Australian Supercross Championship fired into life on Friday night (October 14) at Toowoomba Showgrounds in the Darling Downs region of south-east Queensland and saw CRF Honda Racing riders Joel Wightman and Kyle Webster experience a night of mixed fortunes aboard their HRC backed Honda CRF250R thumpers. For Wightman, the Toowoomba event was a strong one, the young gun from the NSW Hunter Valley putting in one of his best performances of the year by using a boomer start in the SX2 Final and then put in fast and consistent laps all the way to the chequered flag to finish in fifth place. Meanwhile Webster kicked off his night in great style, snaring second place in his Heat race behind Jackson Richardson (Serco Yamaha), but then was caught up in a first turn scramble in the Final that eventually saw him fight his way back to a 12th place finish. 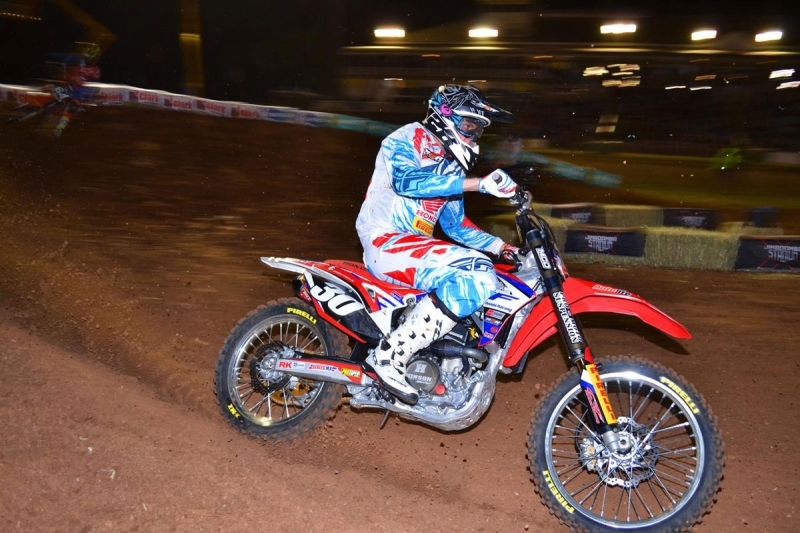 On a cold night, competitors faced a spectacular and technical track layout at the Toowoomba venue, which featured testing rhythm sections and jump combinations that gave little respite through the entire lap. Throwing off the effects of a touch of the flu from earlier in the week, Wightman put in a fourth place finish in his Heat race and then steeled himself for an all-out effort in the Final. “I got a great start in the Final and came out of the first turn in third place, which really helped to set me up for the race,” said Wightman. “But then in the opening laps I made a little mistake on the dragon’s back and took a detour beside the finish line jump, which allowed a couple of guys to pass me. “After that though, it was all good and I just rode fast and consistent laps all the way to the finish and took home fifth place. For Webster, the Toowoomba track was a technical one, and the West Australian ace admitted some parts of the circuit took some taming in the early practice sessions. “But I managed to get the track sorted by the time the Heats came around,” explained Webster, who promptly delivered a great second place finish in his Heat behind Richardson, who would later go on to win the SX2 Final from Hayden Mellross (Yamaha) and Geran Stapleton (Honda). “Then in the Final I got an awesome jump out of the gate,” Webster continued, “but in the first turn I just got bumped around and wound up rejoining the race in last place. All I could do from there was put my head down and try and salvage some points and I eventually came home in 12th place. “Not the result I wanted, but overall I was happy with the way I was riding,” Webster concluded. Sitting in fifth and 18th overall respectively in the SX2 Championship standings after two rounds, Wightman and Webster will use the next fortnight to continue their training and preparation in readiness for round three of the 2016 Australian Supercross Championship, which descends on Wayville Showgrounds in Adelaide, SA, on Saturday, October 29.